Grazia Serbia launched a new special edition of Grazia magazine – Grazia Junior (15.000 copies), which is available for sale for 2 months from the 31st of August to 31st of October. 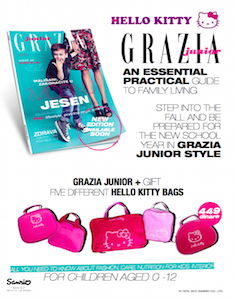 Grazia Junior offers a guide to family living without losing the Grazia touch, both for parents and all people close to children. Inside you’ll finde ideas for activities, recipes for kids, reading tips for educational books and all the latest trends in everything related to growing a child. The issue was advertised and announced on both print and digital media and social networks as well as with a TV spot and a Radio Ad.